Flooding and traffic concerns addressed at land use board meeting. This article was published in the Township Journal on August 4, 2011. 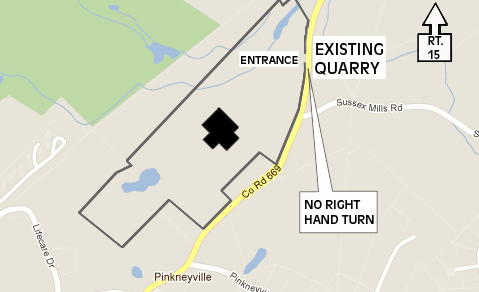 ANDOVER, NJ — Limecrest Quarry Developers had their environmental and traffic experts give testimony to the land use board at a meeting on Aug. 2. Limecrest is seeking approval for a 100,000-square-foot, 24-hour paving stone plant on Limecrest Rd. in Andover. Rejina Sharma, of Matrix New World Engineers, said that Limecrest is in the final stages of obtaining approval from the NJ Department of Environmental Protection for two permits. Sharmer said that she expects the permits to be granted by early Nov. of this year. Sharma drew criticism for not visiting the site during or after a heavy rain to observe flood conditions. However, she said her flood calculations were based on the most conservative criteria available. According to Sharma, the site as it exists now is “not in good environmental condition” and the proposal would be beneficial to the area. The sometimes contentious meeting lasted over three hours and dealt largely with Limecrest’s application. Land Use Board Chairman John O’Connell asked Bernd Hefele, lawyer for Limecrest Quarry Developers, and Sharma, whether they reviewed the report prepared by the Andover Environmental Commission. Hefele replied that they had and took no issue with any of the commission’s recommendations. The report calls for the plant to adopt environmentally friendly practices and comply with statewide environmental initiatives. It also encourages limiting light and noise pollution. “The applicant is going to make this site comply with the noise ordinance in this town,” said Hefele. The board opened up the public comment period to allow residents to question Limecrest’s environmental expert. First up was Louis Coppolino, who voiced his concerns over the proposed plant at prior land use board meetings. Coppolino lives on nearby Macintosh Dr. and said that years ago, Limecrest backfilled on the same wetlands that are now contained in their proposal. “Why would you want to reward a company for doing illegal stuff to begin with?” said Coppolino. Coppolino called on the board to examine old aerial photographs to substantiate his claim. John Reed, who lives on Pinkneyville Rd. near the proposed site, raised concerns about flooding in the area being made worse by operations at the plant. According to Sharma the plant’s design will actually help limit the impact of flooding in the area. Sharma also said that there were no endangered species in the proposal area. Resident Stan Christodlous asked whether operations at the plant would contaminate groundwater. Jeffrey Wolk, whose wife lives in Andover and is a fixture at the Limecrest meetings, questioned why the board was hearing Limecrest’s application if they didn’t have an end-user lined up. Wolk raised this question at the July 19 meeting when it was revealed that Cambridge Pavers Inc. backed out of the plan as co-applicants with Limecrest. Wolk was concerned that a company with a bad environmental track record could come to Andover once the board approved Limecrest’s plan. Hefele started this portion of the meeting by saying that the board didn’t really have the authority to deny Limecrest’s application on the basis of any traffic impact that will occur on the plant’s surrounding roads. This is because those roads are owned and maintained by the county and Limecrest has already obtained approval from the Sussex County Land Use Board. Board attorney Richard Brigliadoro confirmed Hefele’s statement. The expert, Joseph Staigar of Joseph Staigar Engineering, said his firm completed a traffic impact study using Cambridge Pavers as a model for the traffic volume that will occur. Staigar said the plant will run two 12-hour shifts. Twenty-two employees will work at the plant during the day shift and 19 will work the night shift. Trash pickup will be once a day. According to the report, incidental deliveries of propane, color additives, spare parts etc… will occur twice daily. Staigar said that most pickups and deliveries will enter and exit the area via Rt. 15. “Most of the market would be to the north,” said Staigar. O’Connell asked Hefele if it were possible to have the outgoing trucks turn only left – heading north – onto Limecrest Rd. “I can tell you that we can probably agree to that,” said Hefele. Hefele said that he will confirm the stipulation with his client for the next meeting but doesn’t forsee a problem because most of the trucks would turn left out of the plant anyway on their way to Rt. 15. When residents were allowed to question Staigar, most concerns were about noise pollution and traffic flow. Staigar maintained that roads surrounding the plant would maintain “good levels of service.” As for noise, Limecrest has yet to present their noise study. The next meeting is scheduled for August 16 at 7:30 p.m. at the Municipal Building. Hefele said that meeting would concern some minor engineering items and his noise expert would not be ready to testify until the meeting after. He also said that he expects the remainder of the application process will only require two more meetings.